What I love about summer is eating salads such as this. Vibrant in colour, utterly delicious, and healthy too – so it ticks all the boxes for me. If you can get your hands on some Loch Duart hot smoked salmon then I heartily recommend it. They have some oak roasted salmon that is utterly amazing and is so moist and full of flavour that it had my boyfriend and I uttering lots of “mmm’s” in appreciation. You can buy it online but there’s a list of shops stocking it on their website, too. Orzo is a pretty rice shaped pasta which is also great substitute for risotto rice. I did a lovely broad bean, red pepper and fennel risotto with it recently. It works really well in salads, as shown in this recipe, but also in stuffed roast peppers and stews too – so it’s a versatile ingredient worth having in the store cupboard. This salad is really quick to put together so it’s perfect for a quick mid-week meal on a sunny summer’s evening. Cook the orzo pasta in salted simmering water for 8 minutes until al a dente. Test to see and then drain and rinse under cold water and set aside. Repeat with the broccoli but simmer for 4 minutes and then again with the broad beans for 3 minutes. Slip the beans out of their skins and set aside. In a large bowl whisk all the dressing ingredients together, reserving some of the herbs to garnish and then add the rest of the ingredients. Combine gently ensuring you don’t break the salmon up too much. Serve on a large platter dish and garnish with the remaining herbs. 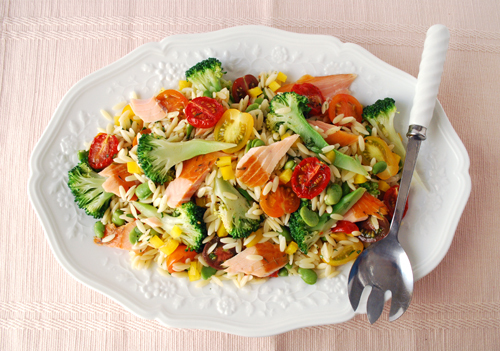 This entry was posted in Recently cooked and tagged cherry tomatoes, hot smoked salmon, hot smoked salmon salad, orzo salad, tenderstem broccoli on 13/09/2012 by Val McArthur. la morphogenèse de tous les éléments du corps, de l’organe à l’organisme tout entier.